Yesterday I was on Freeling Street in Tunapuna. The parking space I found was in front of a well set-up vagrant's dwelling place on the sidewalk near the library. 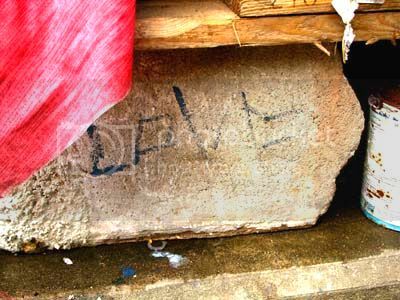 As I stepped out of the car, I noticed 'Love' written on a brick. I then saw another Love message written on a piece of bright yellow plastic in front of the doorway. In retrospect, I would have stayed longer and gone in for some closer, more detailed shots of things inside the abode - e.g. there was a small ceramic angel lying face down on some fabric, deeper within the structure. I didn't get a shot of it. See the six shots I did take (here).